Another long weekend is approaching and with it comes family gatherings and dinner parties. This dish is sure to impress. It looks more complicated then at really is. I have served it twice now and it has drawn rave reviews every time. You can vary the vegetable you mix with the cream cheese. I used chopped baby spinach here but mushrooms, roasted peppers or dill work well too. Puff pastry is a great item to keep on hand in the freezer. It transforms anything into something truly elegant. This dish can be served with just about anything on the side, salad, rice, risotto, potatoes, roasted vegetables ect. Just remember to sit back and enjoy those compliments. Happy Thanksgiving and long weekend everyone! Roll the pastry out on a floured surface so that it is a little wider than the salmon, and the salmon can be completely rolled in the pastry. Mix the cream cheese and vegetable of choice together in a bowl. Season with salt and ground black pepper. 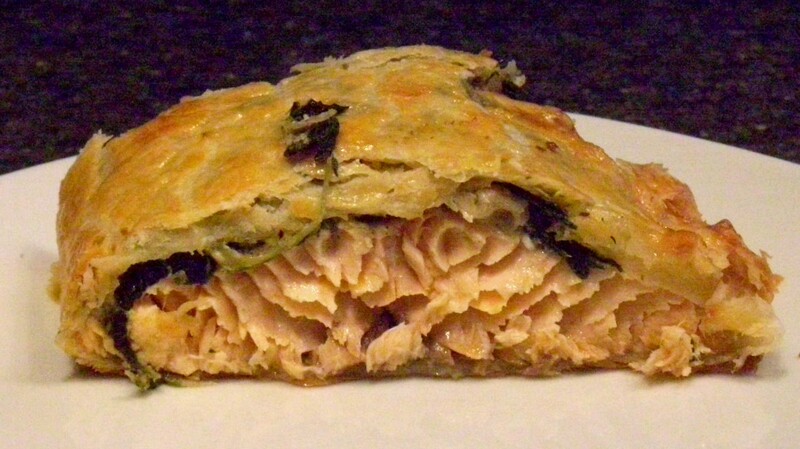 Place the salmon in the center of the pastry. Spread the cream cheese mixture evenly over the salmon. Roll the pastry around the salmon leaving a slight overlap of about an inch. Seal up the ends. Place on an oiled cookie sheet. Brush the outside of the pastry with beaten egg and place in the oven for 30 to 45 minutes, or until golden-brown and the fish is cooked through.